“Ross Machine Company has been a long term manufacturer to a first tier military supplier of secure hand held radio communications equipment. One product line is a high tech, ultra-secure walkie-talkie for American Specials Ops Units including Navy Seals and Army Special Forces. The recent activity in the Middle East bought about a demand for an increased rate of delivery on a whole family of parts from one major assembly. Ross Machine determined that substantial labor savings could be realized on this assembly by automating the parts washing processes for these items. In the past, small batches of parts (between 8 and 24 pieces) were washed and rinsed manually. This process demanded between one and three hours per day from four to six machine operators. After a trip to the IMTS show in Chicago and subsequent contact with half a dozen parts washing vendors we were introduced to the RAMCO line by Rob Frey of Advanced Deburring & Finishing. 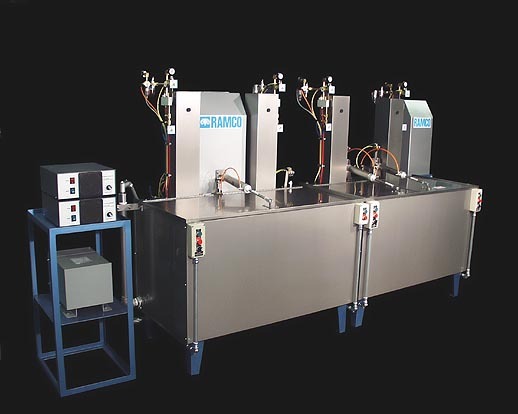 After some research, a couple of sample runs and a visit to the RAMCO factory we decided on a four stage system consisting of two washing stations (one with ultrasonics), one rinse station plus a fourth station for drying. We were pretty much sold on the machine after RAMCO successfully cleaned a batch of sample parts on their first attempt, something that none of their competitors had managed. The second sample run yielded the same results so the decision was made. RAMCO pretty much custom built a system from a series of modules for about the cost of a mass-produced washer. 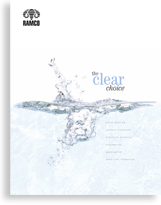 When you choose RAMCO our combined knowledge and experience is at work for you. We have invested years in establishing and developing a network of specialists. They are seasoned veterans experienced in cleaning equipment, chemicals, process development, effluent recycling, installation, training and support. Our combined know how is focused on providing cost effective high quality systems with the highest regard for worker safety and the ecology.